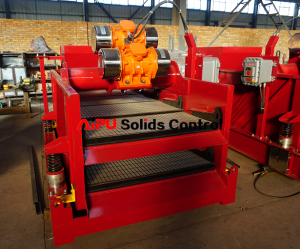 Oilfield equipment – linear motion shale shaker is the first phase solids separation equipment by separating drilling cuttings 100 to 500 microns and above depending on shaker screen mesh size. 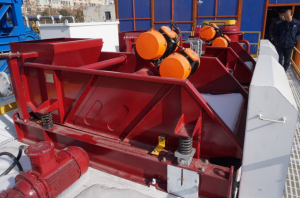 The shaker may install shaker screen 10 to 170 API mesh depending on drilling requirement and mud flow capacity as well as solids size separating requirement. There linear motion shale shaker, balance elliptical motion shaker and dual motion shale shaker from various drilling equipment suppliers and linear motion shale shaker is the most popular type shaker for it’s large mud flow capacity and steady working performance. 1. 2 sets of high g force vibrating motor installed on shaker deck with same specification. The motor size will be depending on shaker size and G force requirement. 2. 2, 3 or 4 panels shaker screen installed, The oilfield shaker is 3 panels or 4 panels normally because of high volume requirement with larger screen area. The 2 panels shaker normally for desander or desilter bottom shaker, or small drill rig activities like water well drill, horizontal directional drill, rotary drill, etc. 3. The shaker screen design and manufacture need meet API RP 13C regulation. The mesh size is related with separation micron by screen wire mesh. 4. The shaker deck angle is adjustable by mechanical wheels at -1 to +5 degree. The normally working dangle is maximum 2 degree normally. 5. The electrical control panel will be welding on shaker skid for easy control beside shaker. The panel can be explosion proof or non explosion proof with different standard as per request. Linear motion shale shaker is the most popular and well used design in oilfield. 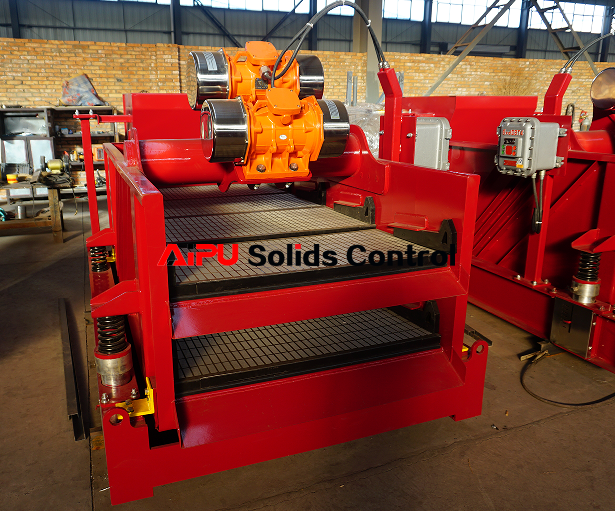 AIPU supply dual motion shale shaker too. Other than shale shaker, AIPU build a complete line solids control equipment including mud tank. Please contact us freely .